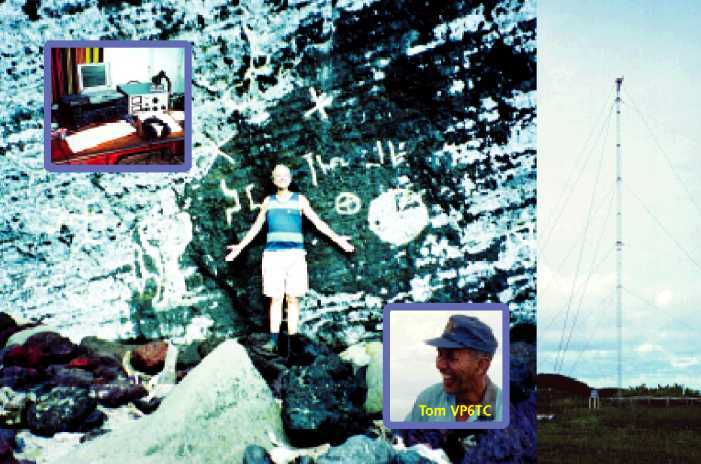 Click here to look inside the QSL card! Sorry but the search applet requires a java aware browser. With thanks to Richard Everitt G4ZFE for the search applet. Eventually I plan to send a QSL for every QSO in my log via the bureau system. If you want to get your VP6BR confirmation sooner than after a year or so, please send your card with an airmail SASE (Self Addressed and Stamped Envelope) or a SAE with IRC or green stamp to my address. If you want to support my DXpedition, you can send more than one IRC or green stamp but that is not required to get a reply. If you want to put a stamp on your return envelope please use only Finnish stamps. Use only Air Mail envelopes or usual envelopes with an Air Mail sticker as a return envelope if you want your QSL via AIR MAIL. Be careful not to forget to enclose the return envelope with your address printed or clearly written on it PLUS the requisites needed for mailing my card back to you (a Finnish 3.50 stamp, IRC or equivalent in hard currency). If you fail to follow this I shall send my card to you via the bureau and that will be a long wait. Please note that an address label does not compensate for the lack of a SAE. Put your address label on the return envelope where it should be. 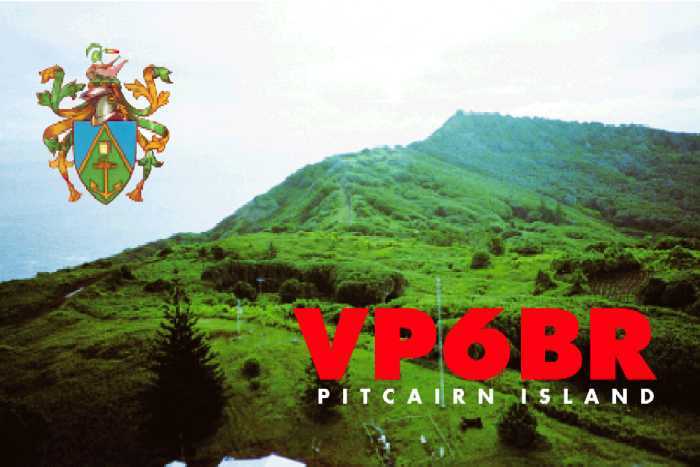 If you have made more than one QSO with VP6BR please do not send a separate QSL for each QSO. 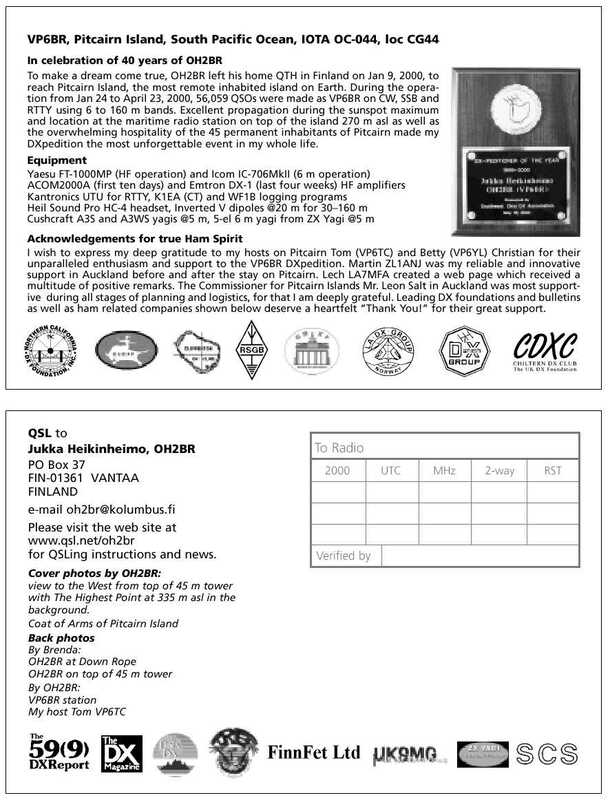 Put all of your QSOs on one QSL or on a piece of paper. Please do not ask me to send Finnish stamps to you. I am a ham not a philatelist. IMPORTANT! Please show multiple QSOs in CHRONOLOGICAL ORDER, not grouped by bands and/or modes. I shall be checking the QSOs in the order they were logged so please make it easier for me. I log the QSOs with the CT logging program by K1EA and then transfer the log files to the DX4WIN logging program. DXers wanting to have special service such as every QSO written on a separate card please prepare to be the last in line. You will have it your way but I shall serve the less demanding DXers first. I shall start printing of the VP6BR QSL card as soon as I arrive home. That takes some time. Processing the received QSLs requires several months of hard work so please be patient. You can visit this page also AFTER the DXpedition to find out how the QSLing progresses. Let us work together from this moment to the moment you are holding your VP6BR card in your hand. Thank you for reading these instructions and see you in the pileups! This page is sponsored by The Daily DX.